It was dusk and the faint glow of a smartphone screen illuminated the face of a small girl intent on capturing an imaginary animal in the street in front of The Malibu Post. The girl's father, hovering nearby, called instructions: "Wait until there's a green circle, that's it!" The Pokemon was successfully captured and the pair moved on. I felt a certain kindred feeling. I've spent the last several months attempting to track down a full collection of creatures, too, but while my hunt was for real world creatures, several proved every bit as elusive as any legendary beast. Anyone who lives within the boundaries of the Santa Monica Mountains National Recreation Area has lizards among their nearest neighbors. They sun on the rocks in the garden, or zip across the driveway. Sometimes they show up uninvited in the house where they may end up mummified under the couch or on the cats' menu, but mostly the reptile world and the human world occupy the same space largely unnoticed by the inhabitants of each world. That's unfortunate, since human activity can inadvertently take a terrible toll on lizards, and because lizards are beneficial and interesting and worth a closer look. However, just because they often live among us doesn't mean they're easy to find. 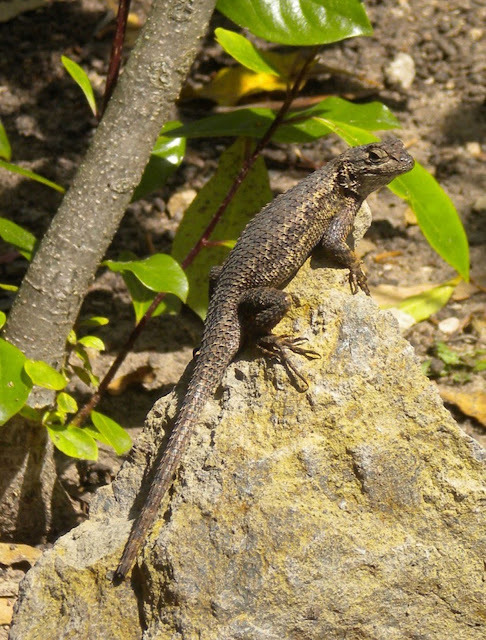 The Western fence lizard is the most common reptile in Malibu. It is quite happy to take advantage of garden features like rocks and fences. Those fantastically long toes and claws on the hind feet enable the fence lizard to almost effortlessly climb vertical surfaces like tree trunks. Seven lizard species can be found in the Santa Monica Mountains. Four of those species can be found even in urban gardens, but the Western fence lizard is far and away the most commonly seen reptile. This small cousin of the iguana lives alongside humans, successfully surviving in even the smallest gardens and yards, but also abundant in the wild. Fence lizards are beneficial garden residents. They feast on creatures humans regard as pests, including mosquitos, ticks, scorpions, centipedes, beetles and spiders. 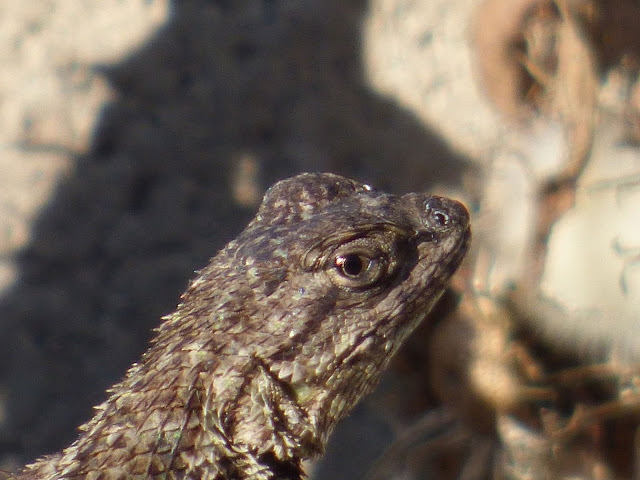 Fence lizards are, in turn, a key food source for everything from hawks and roadrunners, to gopher snakes and larger lizards. The Western fence lizard's Latin name, Sceloporus occidentalis, let's you know that this is the Western spiny lizard. 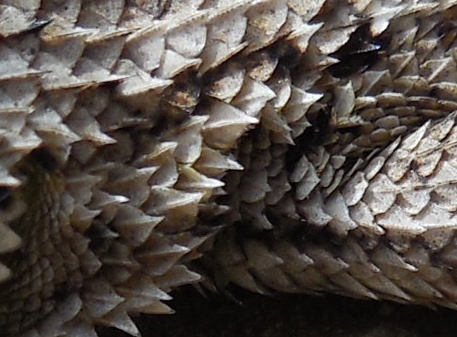 Up close, the fence lizard's back scales resemble a pinecone. Fence lizards that don't end up on the menu of some larger animal can reportedly live for as much as five or six years. 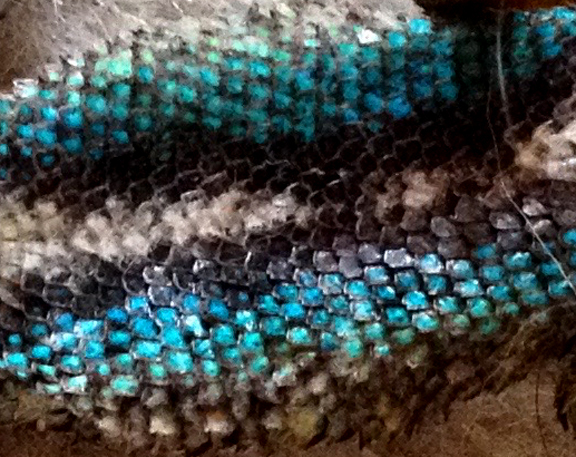 The metallic blue stripes on the fence lizard's underside give this species its other popular name: the blue-belly. This is an adult male. 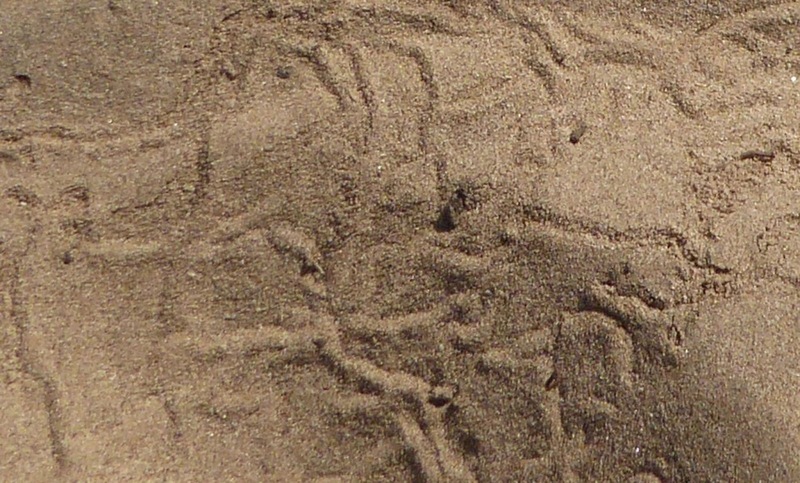 Females have much fainter markings. Some Malibu gardens are also home to another iguana relative, the side-blotched lizard, Uta stansburiana. This small elegant lizard comes in a surprisingly wide range of colors and may have spots, stripes or, sometimes, no markings at all. 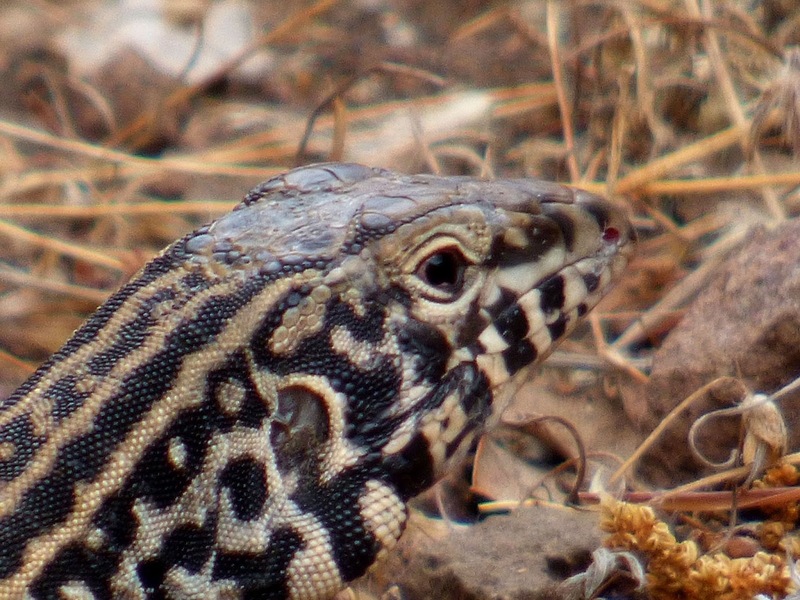 Some Malibu residents have this beautiful lizard in their gardens. At first glance, the side-blotched lizard closely resembles the fence lizard, but this species has brighter, lighter markings and a scale pattern that is much less spikey than the fence lizard's. 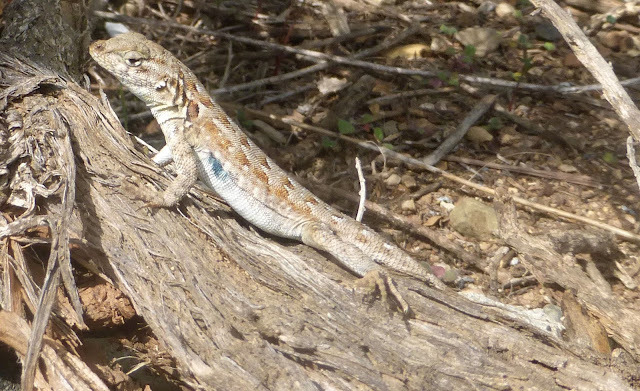 Visitors to Point Dume State Park or Malibu Bluffs Park Open Space are almost guaranteed to see the colorful side-blotched lizard going about its business of hunting ants and other small invertebrates. Like the fence lizard, they are an important food item for numerous other species of birds, reptiles, and mammals. 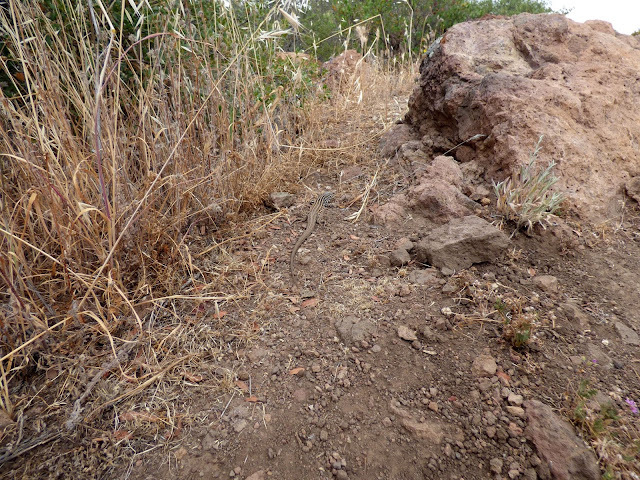 Unlike the fence lizard, they are not strong climbers and prefer to stay close to the ground. 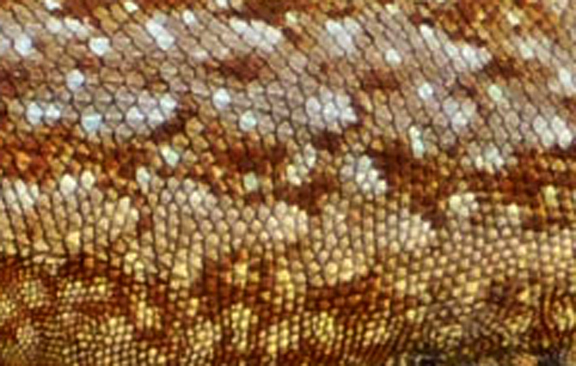 The side-blotched lizard's scales resemble a George Seurat painting. Fence lizards and side-blotched lizards are active, lively lizards. They dart around the garden in pursuit of insects, sun themselves on rocks, squabble with their neighbors, and often lounge in the middle of the driveway. However, there's a third common Malibu lizard species that many Malibu residents have never seen, although it also lives in our gardens. 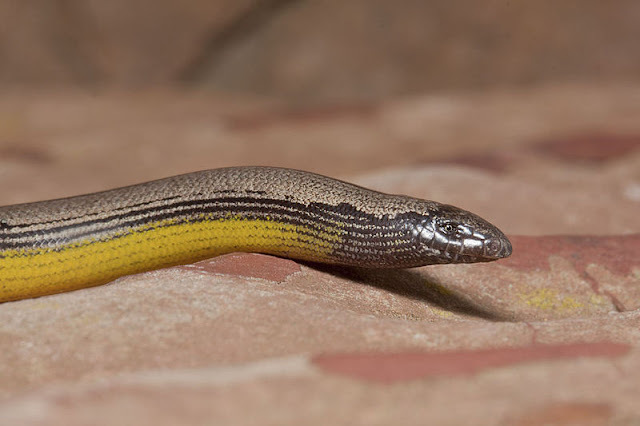 The Western skink, Eumeces skiltonianus, is a sleek, secretive lizard that stays close to the ground, hiding under rocks and dead leaves, and even tunneling underground when the soil is moist. We rescued this unfortunate Western skink from the cat, who apparently heard me lamenting that I needed a good photo of a skink and decided to present me with one—quite a feat for an indoor-only cat. This little guy clearly had another recent close call, its tail has detached and is just beginning to grow back. Juvenile western skinks have a bright blue tail. Adults like this one are a sedate cinnamon color. 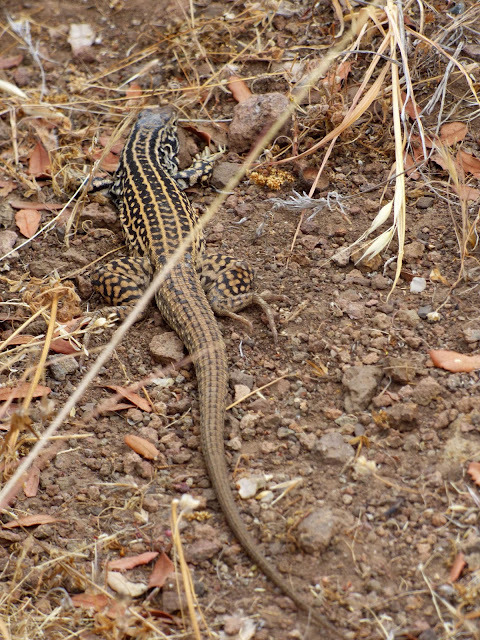 The Western skink has a taste for sow bugs and moths. Possibly because of its secretive ways, it is longer lived than other local species, reportedly surviving for as much as 10 years when conditions are right. The fourth common garden lizard is the fierce and robust Southern alligator lizard. Alligator lizards are not closely related to true alligators, but apparently no one bothered to explain that to them. They are fierce, grumpy and aggressive. They swallow other lizards whole, devour mice and small birds and have a remarkably painful bite for something that doesn't have teeth. This is the undisputed Malibu lizard king, the alligator lizard. I photographed this nearly foot-long behemoth at Malibu Bluffs Park. 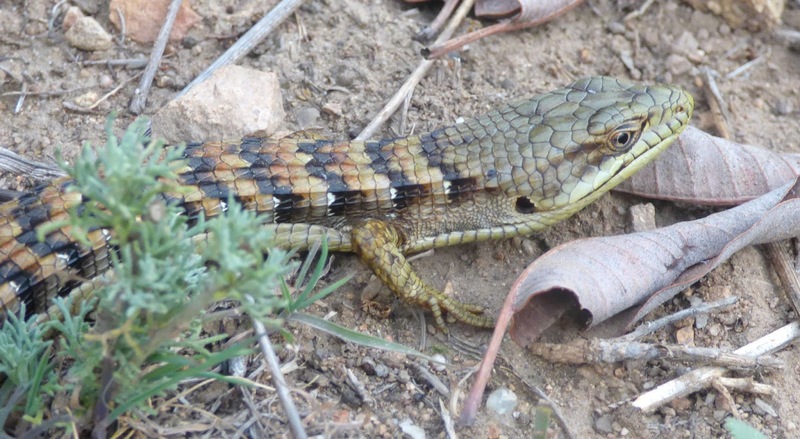 The alligator lizard gets its name from its gator-like looks, but it isn't a close relative of its namesake. This is, however, a fierce and voracious beastie, that will swallow smaller lizards whole, and has been known to go after birds, rodents, and people's toes. 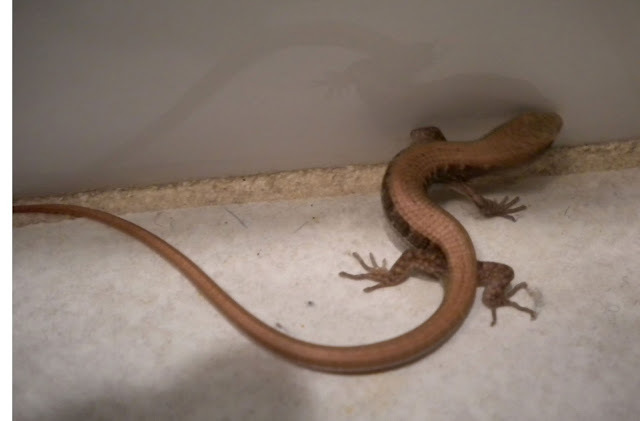 This juvenile alligator lizard strayed into the bathroom and had to be rescued before it became a cat treat. Juvies are smooth and bronze-colored, and lack the distinctive scale pattern of the adults. Here at The Post we find best way to rescue a lizard from the house is to herd it into a bucket or wastepaper basket, cover the container with a newspaper or book, and cart lizard and container to a safe place for release back into the garden. Many lizard species are territorial, so it's a good idea not to take them too far from their point of entry into the house. Screen doors can help cut down on the number of uninvited reptilian houseguests. 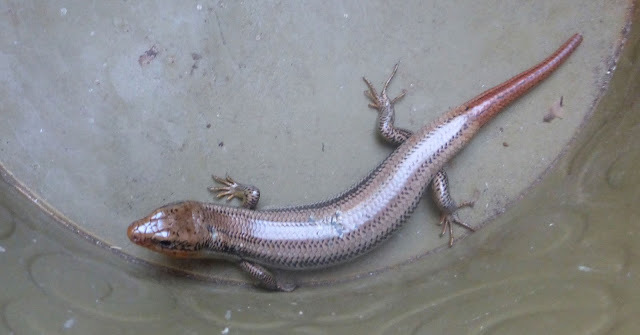 Our fifth native lizard may also be at home in the garden, but it is almost never seen, and when it is it gets mistaken for either a small snake or a large earthworm. The legless lizard, Anniella pulchra, spends its life almost entirely underground, tunneling through sandy soil for grubs and worms. We've never seen one here at the Malibu Post, but a new subspecies turned up recently near a runway at LAX, of all places, so it iss a distinct possibility that this small secretive lizard is quietly living its life just a few feet away from where I sit writing this post. Here's a photo of A. pulchra courtesy of Wikipedia Commons. Although it looks like a snake, it is a true lizard, equipped with a detachable tail-tip to fool predators into thinking they've caught the whole animal. It also has eyelids and can blink, something snakes can't do. Mystery marks in the sandy soil at the Point Dume Headlands may indicate the presence of legless lizards, but this observer has never seen one at work. Here's a closer look at A. Pulchra. This photo was taken by Marlin Harms in Los Osos, CA, and appears on Wikipedia. The remaining two local lizard species are, unfortunately, increasingly rare. The coastal whiptail was already rare when I was a child, but there was a time when this colorful lizard was abundant throughout the area. The long pipe-stem lizards sunned themselves near by, but they are not very harmful; they are so called because, if struck by a stick, their tails fly into as many pieces as a pipe stem when broken on the pavement. The common little lizards are harmless, sometimes being even used for pets. I do not like to recall the remembrance of a lady in Saint Augustine, Florida, I once knew, who had such a creature for a pet, feeding it regularly and taking it in her hand. A Californian I have known who would catch them, put them on his shoulder, and let them run at will over his back. These things are told to ward off fears of poison. The big pipe-stem fellows, however, I will not vouch for. We wouldn't vouch for them either, because this lizard has some formidable claws. 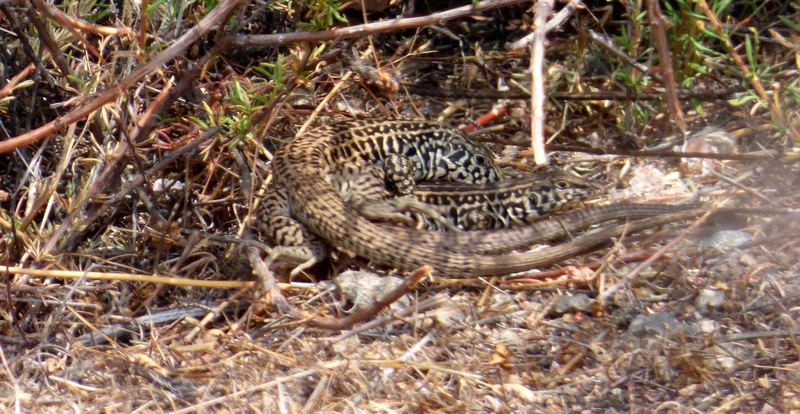 There are two Southern California whiptail species. Ours is Aspidoscelis tigris stejnegeri, the tiger whiptail. There's also an orange-necked whiptail, that lives in San Diego County. We had to go into the back country of the Santa Monica Mountains to find this beautiful beast. The coast whiptail was once common in Malibu. Frederick Hastings Rindge talks about this species in Happy Days in Southern California. Habitat loss in Malibu has left it on the California species of special concern list for this area. 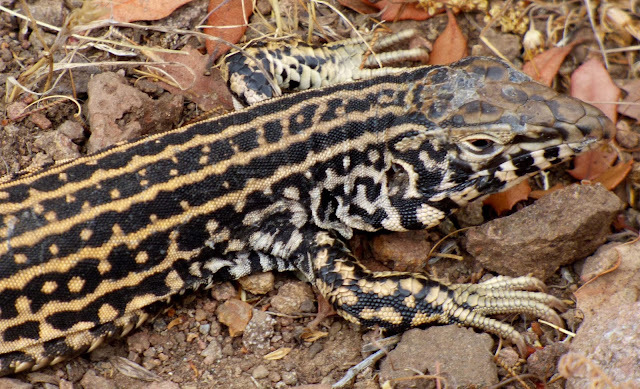 The whiptail is a medium-sized lizard with powerful legs that enable it to move fast. It also has formidable claws, and despite the dramatic yellow and black markings it has mastered the art of not being seen. Can you spot the lizard? Finding lizards can be like a cross between Pokemon Go and Where's Waldo. Most whiptails are in a fearsome hurry, but this one was surprisingly cooperative about being photographed. We had to go on an expedition to the back country to find whiptails for this article. This species is a California Species of Special Concern, and can only be found in a few locations in the Santa Monica Mountains. It was May, and we witnessed a strange and wonderful thing, the mating dance of the whiptail, which involved a sort of fencing match, followed by Sumo wrestling. By now, the eggs will have hatched, and a new generation of whiptails will be embarking on the dangerous life of the lizard. Coastal whiptails engage in a complex mating dance. This photo was taken in Triunfo Canyon in May on 2016. We never expected to find a legless lizard for this article, but I had high hopes for finding the seventh species, the coast horned lizard, Phrynosoma blainvillii, also known as Blainville's horned lizard. When I was a child, horned lizards were common in Malibu. I vividly remember the first one I ever saw. It was at the Paradise Cove Mobile Home Park. My friend's mother called us over to see it just outside the door of their Airstream. I was four years old, and enchanted. It looked exactly like one of the plastic dinosaurs I played with at home. 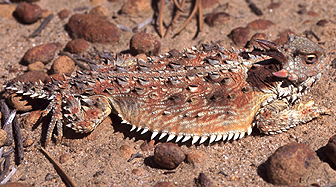 The horned lizard remained a personal favorite, but even so, I couldn't tell you when it began to disappear. Habitat loss and the mass invasion of the tiny Argentine ant, which displaced the native ants this lizard feeds on, are to blame for this this species ending up on the California Species of Special Concern list. That's why it's ironic to me that after months of hunting for the once plentiful horned lizard to photograph for this blog post, I finally spotted one at Malibu Bluffs Park Open Space, right where the City of Malibu is planning to build new baseball diamonds. The encounter left me with the uncomfortable feeling that the day may be coming all too soon when this species will be joining the dinosaurs that it resembles, and that Malibu, in an effort to provide recreational facilities for the community, will be unintentionally hastening its demise. Pokemon Go has taken the country by storm. A player in New York made headlines last month for reportedly "collecting them all." It's great that the game is getting people out of doors, but here at the Malibu Post we could wish that our own real live amazing creatures are as valued and appreciated as the imaginary ones currently so highly prized.